To what lengths would you go to get your hands on some über fresh, Hoof Hearted beer? 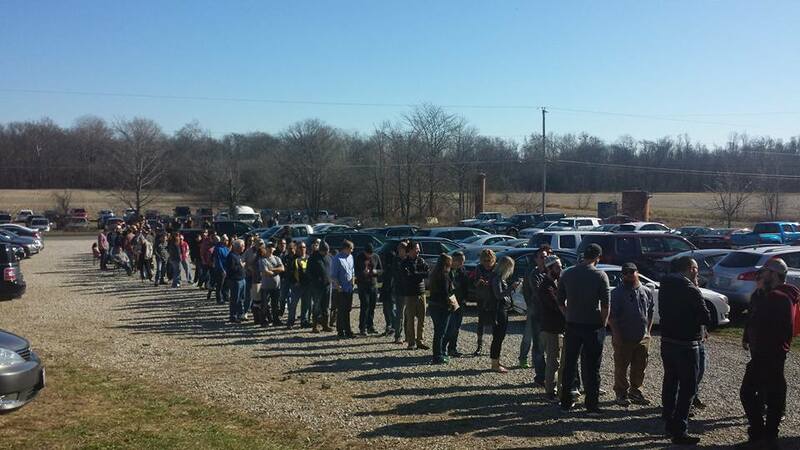 Would you be willing to drive out to the farmlands of Morrow County and spend a good chunk of your Sunday afternoon standing in line? The answer for hundreds of Central Ohio beer lovers is a resounding yes. The popularity of their can release events just keeps growing, reaching a fever pitch this past Sunday with the debut of Dragonsaddle Triple IPA in packaged format. I wasn’t able to be there for the entire event, showing up mid-afternoon but I’ve pieced together some eyewitness accounts to give you a sense of the spectacle that occurred when hordes of craft beer heads spontaneously converged on a barn, which to quote David Byrne of the Talking Heads, is located on a road to nowhere. 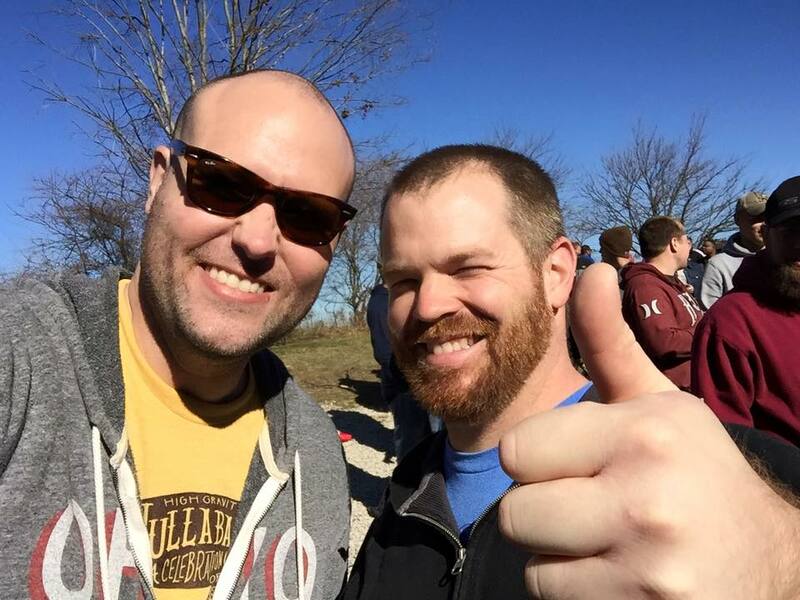 I was a latecomer to the party because I attended the Wolf’s Ridge/One Line beer and coffee pairing event on Sunday morning. Although an aside to this story it was a great event that featured beers ranging from their Dire Wolf Imperial Stout infused with a Sumatran coffee, to their Hefeweizen infused with a blueberry forward Ethiopian coffee. For each of six beers you got to taste the coffee and the beer side by side, while Wolf’s Ridge head brewer Chris Davison and One Line owner Dave Forman circulated and provided a wealth of details on the coffee, the beers, and the brewing process. My favorite coffee/beer fusion of the morning was probably the Sustinator Doppelbock infused with Guatemalan La Bolsa coffee. The fruity, almost pear like flavors of the coffee paired nicely with the caramel sweetness of the doppelbock. I normally find doppelbocks to be a little too cloying, but that was not the case with this beer. The finale was their excellent Imperial Pumpkin Ale Pi, which has single handedly changed my opinion of pumpkin beers. There’s a line to the street right now… Don’t know what that means for beer but I’ll try to keep u updated. The line at Hoof Hearted at 11:30 am thirty minutes before the doors opened. The brewery is located just past the green and white food truck in the distance. Photo courtesy of Tommy O’Brien. Given the seemingly dim prospects of getting there soon enough to score some beer, I decided to attend the basketball game and then head up to Hoof Hearted to assess the carnage. The game was a bit of a snoozefest, but it was good to see craft beer pouring at the Schott—Four String Brass Knuckles IPA and North High Pale Ale. Unlike the football games, beer is available for the masses at the Schott not just the luxury box holders (at least to those of the masses with $9 to burn). When I arrived at Hoof Hearted around 2:30 pm there were small groups of people scattered all over the property. People were lounging in folding chairs sipping hop forward ales and enjoying the unusually gorgeous mid-November weather. Those who were sitting next to cases of forest green 12 ounce cans of Dragonsaddle looked particularly satisfied, knowing that their day’s mission had been accomplished. You didn’t have to look hard to find empty bottles and cans from other breweries—Three Floyds, Russian River, Surly, Jackie O’s—evidence that the better prepared attendees had decided to make this an excuse for a bottle share. The sun was shining brightly, kids were playing in the woods behind the brewery, someone had cleared away the rotting deer skull from the porch of the little shack that sits in front of the brewery. An air of utopian bliss had settled over the place (at least for those no longer in line). Even at 2:30 pm there were still two lines extending out of the building, each with roughly 30 people in them, so my wife and I got in one of the lines and kept our fingers crossed that we might just get some Dragonsaddle after all. Alas it was not meant to be, with about 10 people between us and the servers they announced that all of the cans were gone. Five minutes later with only two people in front of us draft pours of Dragonsaddle ran out. C’est la vie, I had a pint of Barely a Beginner, an IPA brewed with experimental hops and made in collaboration with the Cambridge, MA beer bar/brewery Lord Hobo. Predictably it was a tasty treat, with all of the aromatic hop presence you expect from a Hoof Hearted IPA. Well, when then opened the doors at noon, the line went down to the road and curved back up through the parking all the way to that little shack. Tommy was kind enough to share the pictures used here to illustrate his point. That begs the question just how much beer was sold. According to brewer/owner Trevor Williams they went through approximately 270 cases of Dragonsaddle in 2.5 hours. Remember that they were imposing a 1 case per person limit, and at a price of roughly $12 per 4-pack it’s safe to assume not everyone bought a full case. You can do the math but I think it’s conservative to assume that at least 400 hop heads descended on Hoof Hearted homestead. 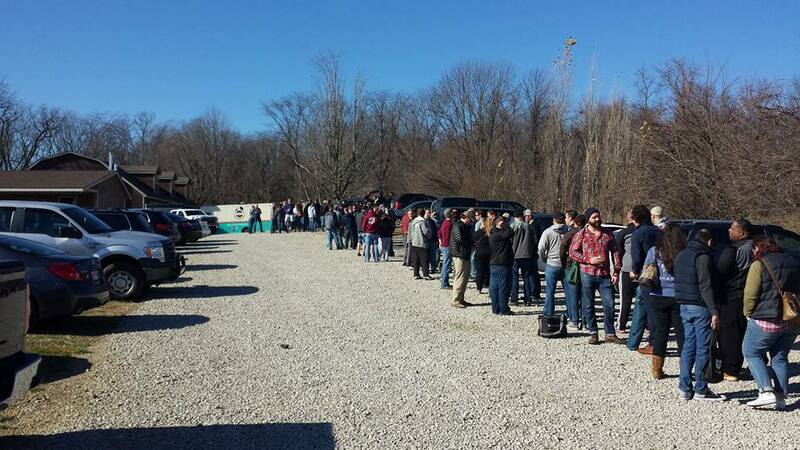 The line a little before 2 pm (photo courtesy of Tommy O’Brien). I know some of you have attended release parties that draw bigger crowds like Dark Lord Day or the Dark Horse 4 Elf Party, but I would argue this is a beast of a different color. First of all there is the remote location of the Hoof Hearted brewery (not that Marshall, MI has that much on Marengo). Next you have factor in the lack of amenities and other attractions that normally accompany a beer release. A typical Hoof Hearted can release party features one food truck (this time it was Korean tacos served up by Altered Eats), one bathroom, minimal seating, and no live entertainment. Finally you have to take into account the frequency of the event. Dark Lord Day happens once per year, Jackie O’s beer releases are held once every few months, but this was the third Hoof Hearted release in the past month, following Sidepippin’/Barely a Beginner (Nov. 8) and Roller Blabe (Oct 18). Is the beer worth it? Obviously I can’t comment on this batch of Dragonsaddle (if anyone would like to send a can of the precious elixir my way I would be happy to write and post a review, as a community service you know), but I did have some last winter. From what I recall (and the details are as hazy as the beer itself) it’s highly aromatic, there’s a surprisingly low level of bitterness, and the alcohol is masterfully hidden behind a wall of hops, descriptors that apply pretty well to the entire portfolio of Hoof Hearted IPAs. We got there at 9 and had a big bottle share. It was fun, but I’m worried we just started an arms race for earlier and earlier arrival times. Thanks for nothing Oldham, it looks like I might need to invest in some winter camping gear if I want to insure that I don’t come away from future release events empty handed. The next two Hoof Hearted can release parties are Musk of the Minotaur IPA on Sunday, November 29, and the first foray into a new series of single hop DIPAs, aptly entitled “Everybody Wants Some”, on Sunday, December 6. The first release of Everybody Wants Some will feature Nelson Sauvin hops. Doug Oldham celebrates landing the first allotment of Dragonsaddle with Hoof Hearted’s Ryan Bichon. I have one for you. Send me your shipping address.